TREND ALERT: The Maxi Skirt Shows Off Its Versatility This Spring. Ever since the 1920’s, the long skirt has had a rough road. Competing against the shorter, more revealing styles, the maxi skirt almost went extinct many times, but has pulled itself back from the brink. Today, the maxi skirt is coming back in many forms. These long skirts are great for all seasons, but are taking Spring by storm. Here, this young woman is wearing a black maxi skirt that all but covers her brown cowboy boots. With the frigid winter air still in the area, she paired her maxi skirt with a tan leather jacket and a grey linen scarf. Her bright yellow animal print bag plays well against the black of the skirt, giving a big pop of color. On another chilly day, this woman wore her grey, jersey maxi skirt with grey leggings and ivory Converse All-Stars. 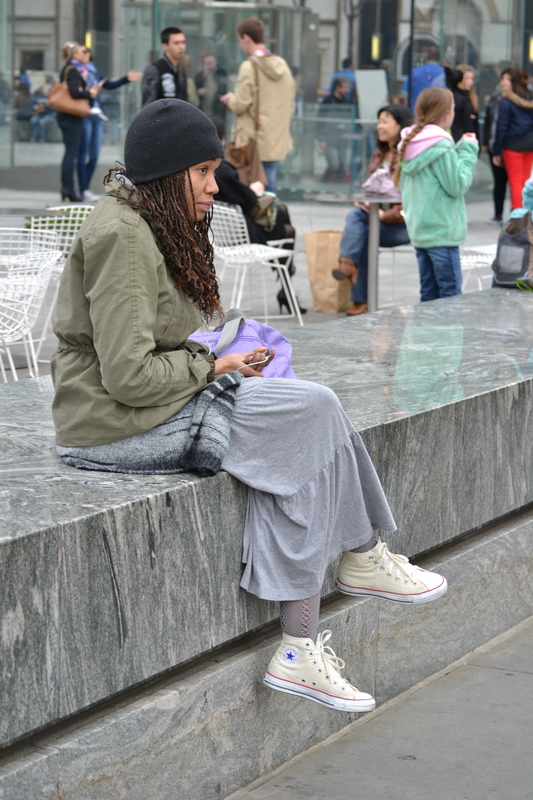 On top she wore a belted olive drab field jacket and a black beanie covering her box braids. A very casual, yet hip outfit for walking around New York City. This young woman sports a very comfortable looking, jersey maxi skirt, with horizontal stripes. Her black Birkenstock clogs cohere to the black stripes of the skirt. The orange tee, keeps with the comfortable motif and also adds a nice touch of color. This young lady walking her dog in Central Park, knows how to dress for a scorcher. An airy, black chiffon maxi skirt and thong slippers are a great pair when fighting off the heat. When united with a loose semi-sheer jersey tank, the ensemble reflects that of a Bohemian artist. The beaded choker, floral headband and messy bun only add to the affect. A great outfit for any hot day in New York City, or pretty much anywhere for that matter. This buxom brunette looks as though she just walked out of the Riviera. Her flowing, tiered, white linen maxi skirt, is something straight out of the Mediterranean Region. Her bright red, spaghetti strap tank accentuates her bosom and the belt creates a narrower and higher looking waist. The man watch is also a nice touch. Posted on April 22, 2012 by Capture the Streets	This entry was posted in Fashion From the Streets and tagged fashion, New York City, photography, Skirt, style, Trends, Women's Fashion. Bookmark the permalink.